"But with Saturday fast approaching, I'm going to have to decide beforehand how far I'm willing to 'swim' without quitting. I've decided that as long as I feel healthy and am not suffering beyond reason, I should have no reason to quit the race before the official cut-off time (48 hours. That's right.) I have the option of sleeping along the way. I'll have enough food to stuff a luau pig. And if there's one athletic talent that I have, it's plugging along — even when the going is insufferably slow. How long will it take me to swim 100 miles? I don't know. But I'm fairly certain I could walk 100 miles given 48 hours to do so. Not that I'm about to enter this race in the foot division." I wrote the above paragraph on Feb. 14, 2006, a few days prior to lining up at the start of the Susitna 100 with my bicycle for my first-ever race. I was referring to a weather report calling for temperatures in the high 30s, sleet and rain, which sadly came to fruition. I finished after 25 hours and a lot of bike-walking through the slush (probably in the range of 35 miles with my skinny-tire mountain bike). I was shattered, but yet somehow hooked on endurance sports. And here I am, five years later, expecting to walk "run" the whole damn way! Spring came to Missoula this weekend. It may not stick around for good, but when it's 55 degrees and partly sunny, and you're climbing a mountain in a cotton T-shirt as the sweet aroma of thawing dirt swirls in the air, you can feel confident that you're at least getting a taste of spring. 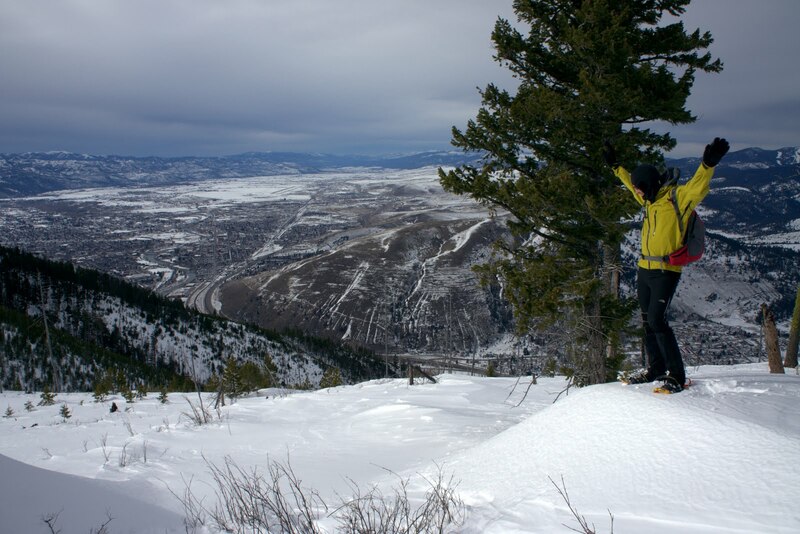 The warm weather did somewhat squash Beat's and my plans for one last White Mountains snow-bike training weekend together before I have to ship the bikes off to Fairbanks. 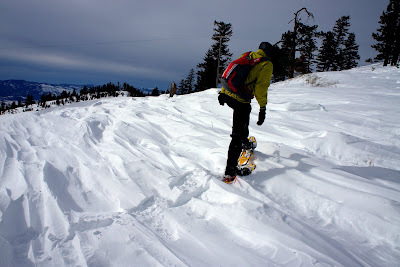 On Thursday night we got a slow, strenuous six miles of soft snow running with the sleds. 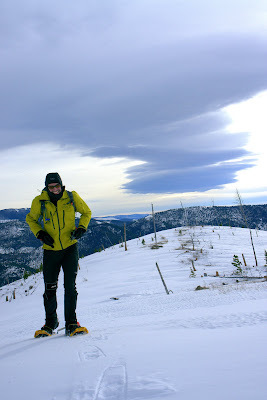 On Friday we climbed the slush and dirt up to South Sentinel, and on Saturday braved the deep slush with snowshoes to the top of University Mountain, which at 6,000 feet was fairly cold and windy, but otherwise nearly scraped clean of snow. I think it's going to be an early year for Missoula mountain biking. We had a lot of fun not working out this weekend, just sauntering along, taking lots of photographs of the wind-sculpted snow formations, and even building a snowman on the trail. Beat really emphasized the need for "taper," and it was good to have his voice of reason, because the weather was so fantastic that it felt strange not to at least try to go big, not that the conditions really warranted anything reasonable. Even the five-mile snowshoe to University Mountain at casual pace was fairly strenuous thanks to the soft snowpack. We did have lots of extra time to pack and repack our gear, make last-minute lists and switch things out, discuss options for airplane baggage and shipping, and stock up body fat stores via generous servings of Big Dipper ice cream and pasta. When we weren't occupying ourselves with little chores or hikes, we did have occasional "freak-outs" where we would just grip each others arms, clench our teeth, and make distraught faces. Even these open displays of distress weren't quite enough to satisfy Beat. He thinks I should be more freaked out than I am. After all, this is my first 100-mile run attempt, and six months ago I wasn't even remotely a runner. But for some reason the physical effort doesn't seem as daunting to me as it probably should. Just as I did five years ago, I still feel confident in my ability to slog. I think that the Susitna 100 is fairly dissimilar to a regular ultramarathon in many ways. Even though it's "flat," two overwhelming forces — the friction of snow and the drag of a ~25-pound sled — conspire to really make it "uphill" the entire way (this is the way it feels on the bike, and based on my sled runs so far, even though many of them have literally been uphill, I believe the force is something that should be heavily factored into the effort needed for the run.) Add the below-freezing temperatures and scarcity of checkpoints, and it's really nothing like running the Western States 100 or Wasatch 100. It may seem like convoluted logic, but in my mind the uniquely difficult conditions of the Susitna 100 alone make not being a runner not all that much of a disadvantage to finishing the race on foot. If anything, it may be an advantage to be a rookie runner with previous Su100 course experience. Unless you're an extremely strong runner (and yes I am thinking of Geoff and his 21:43 course record finish in 2007), if you show up at the Susitna 100 expecting to run the whole thing as you would a typical ultramarathon, you're probably in for a rude awakening. 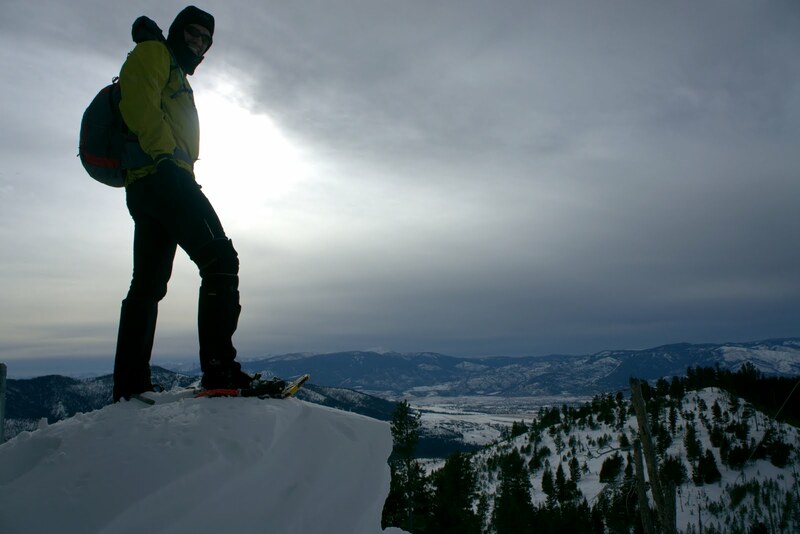 We're all out there fighting the same forces, whether we're dragging a bike or a sled. The key, in my mind, is to show up fit, show up prepared, and, most important of all, keep the right mindset: "Just keep swimming." As for the weather in the Susitna Valley, Alaska, it's currently -4 degrees and clear. It's supposed to remain fairly clear and dry all this week before warming up into the high 20s toward the end of the week. There's a 40 percent chance of snow showers on Friday and 30 percent on Friday, but no big storms on the radar as of yet. High in the 20s and lows in the single digits with some sunshine during the day and stars at night would be ideal, and so far it's looking like a real possibility rather than — as it was in 2006 — a distant dream. But whatever the conditions, I really am looking forward to the swim run. Jill, I hope you have a fantastic adventure! I have enjoyed following your training and admire your ability to suffer a long/cold slog. As hard as you think it will be, you end wishing it were that easy. Don't sweat it too much, it's not like your racing for rent money or anything. You'll learn a little bit, probably say "What the hell was I thinking? ", and eventually the next one will come into view. After all, it's all about the possibilities isn't it? Go, Jill! I know you will keep moving and finish strong! Good luck! I think I'll swim. I was actually thinking maybe I should ski. Swimming sounds better. You're going to do great! Can't wait to follow along. Went out to Flathorn lake this weekend. Trail is nice and firm. Hopefully it stays this way. Good luck!! I just got back from the Yukon. 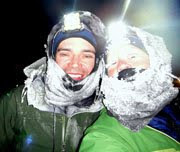 Had a chance to talk briefly with the winner of the 450 mile Yukon Arctic Ultra. You might consider that race, looks like fun,... well, fun in air quotes. From everything I've heard, unless you're an adept skate skier, you might as well not bother with skis because walking 100 miles on classic skis is harder than walking 100 miles without. No sure what the ski surfaces are made of, but have you looked into maximizing the glide (min coefficient of friction) on your sled skis? I bit of hard wax or a little tin or tube of wipe-on flourinated nordic ski wax could make a huge difference, depending on conditions! I don't know, but I think you have your mindset right and will likely do better than 'actual' runners. You totally understand that it might very well turn into a total 100 mile slogfest dragging your sled. For a 'normal' ultrafunner (ie: one who is used to doing races where they can actually RUN most of the distance), they will be in for much more of a shock than you will....as you are totally prepared for it to be REALLY ugly. The mental game is huge here. After the other races you've done (the Iditibake and then the GDR come to mind), you know that when things get tough you can just inch along mile after mile. Can't WAIT to read about this adventure...just be safe!
" ... the uniquely difficult conditions of the Susitna 100 alone make not being a runner not all that much of a disadvantage"
Um ... if you're not a runner now, when will you be? Keep that hard earned mental balance and you will nail it! !